Rows of chairs arranged horizontally, facing the front of the room / speaker. 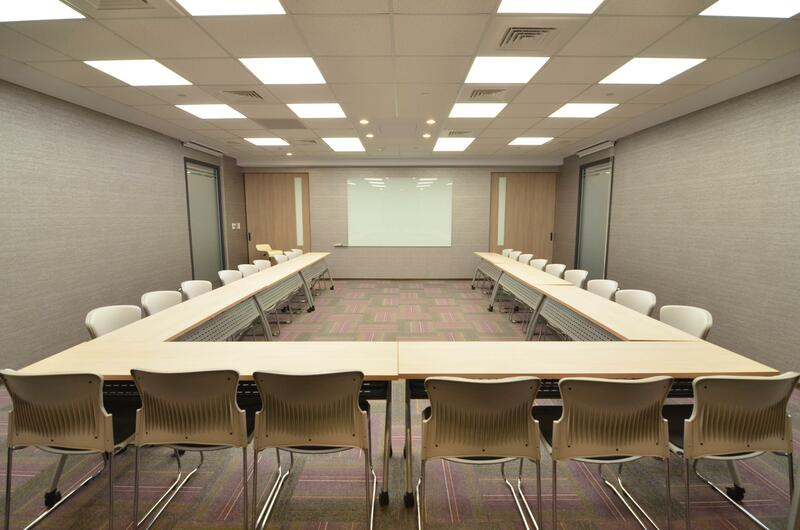 This layout allows the conference room to achieve maximum seated capacity. 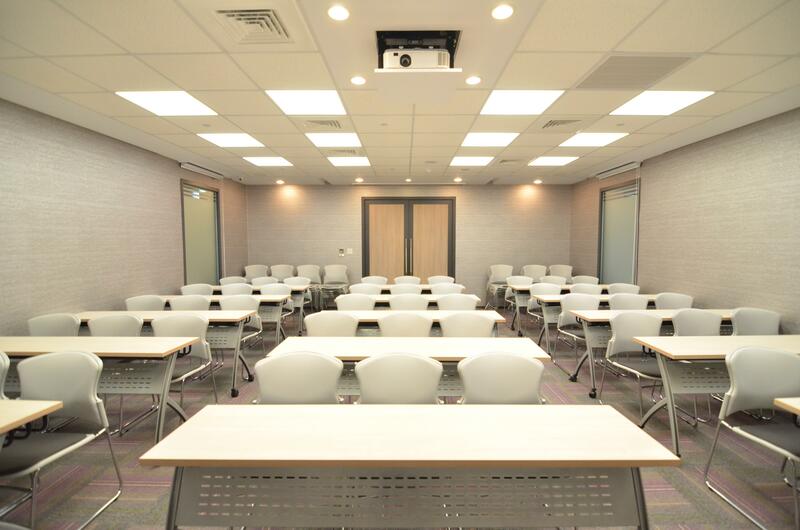 This layout is best suited for mass meetings that last for long hours, especially when the meeting does not require much of note taking or reading. 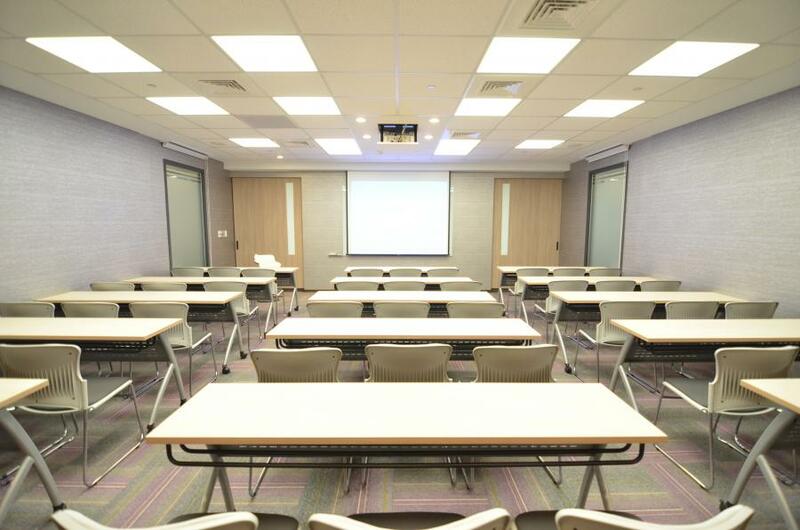 We would recommend this layout for press conferences, training sessions, or orientations, when many attendees will be participating in the event. Tables and chairs are arranged in rows and facing the front of the room / speaker. The tables are there to support writing, laptops or meals. 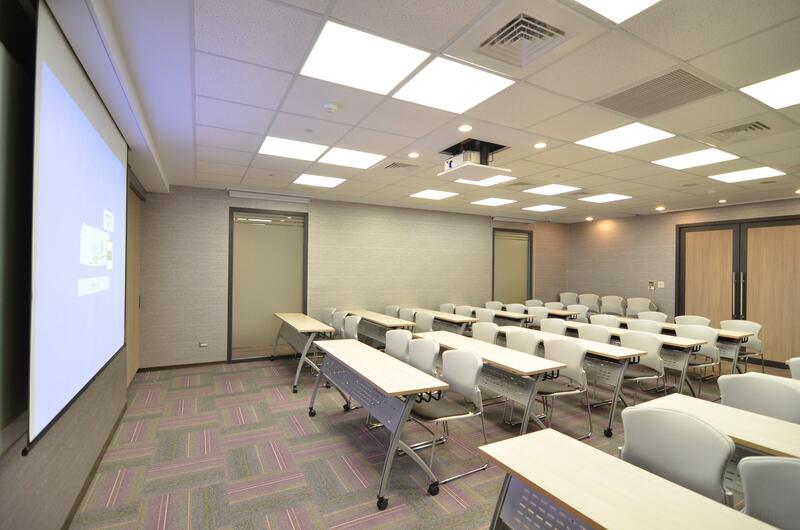 For time-consuming courses, this is a more comfortable layout, appropriate for forums, press release meetings, seminars, trainings that require the audience to take notes. Tables are tilted inward towards the podium/ speaker and then chairs are placed around the tables, leaving aisles between groups. We would recommend this style for forums, seminars, group training sessions, and private board meetings, when group interaction and discussions are needed among audience. However, due to the space limitation of this layout, it will accommodate fewer participants. Joining tables around as a rectangle and leaving the front side (the side which is closest to the podium) of the rectangle open to form a “U” shaped. In this style, tables and chairs are arranged in an open ended configuration with the audience facing inwards. The purpose of the opening is to allow projectors to function or presentations that are visual so that everyone can see. This style is suitable for meetings that need to combine presentation and group discussions. Recommended for video conferencing and small annual general meetings and workshop. For highly social event that requires lots of movements, interactions and networking, we would suggest Cocktail Style. In this style, there are only tables to provide placing of the cocktails drinks and snacks. This style allows participants to mingle freely and maximum capacity. Boardroom style is one classic meeting layout, where a rectangular or oval table is located in the center of the meeting room with all seats around the table facing inwards. It is ideal for debate and discussion and suitable for small meetings. If you would like to present professional image or to leave a formal impression to your guests, we would recommend boardroom style. Here in UICBC, we also provide small meeting rooms suitable for guest reception, business discussions, job interviewing and etc. 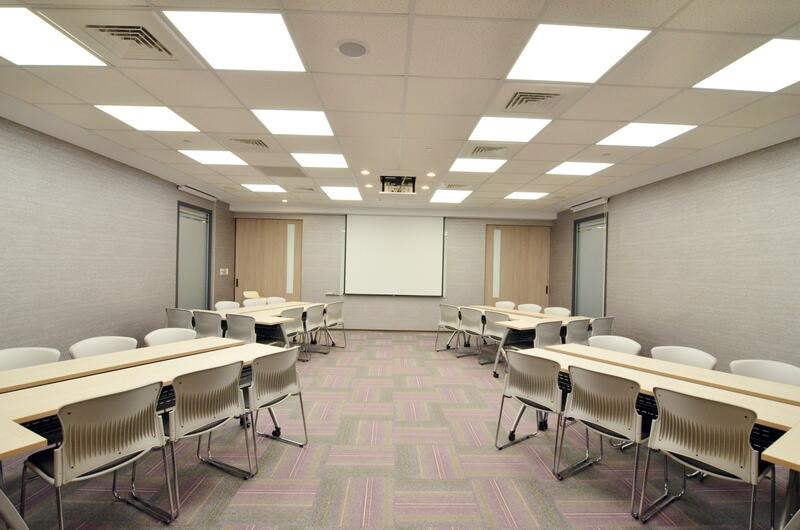 The function and the purpose of the small meeting room can be tailored to your needs.